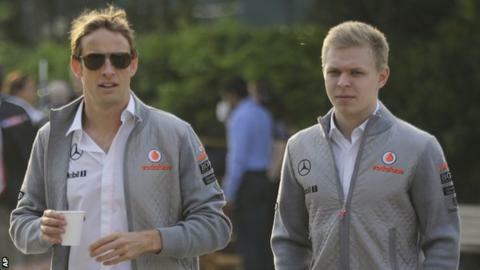 McLaren have confirmed novice Kevin Magnussen will be Jenson Button's team-mate next year. The 21-year-old Dane will replace Sergio Perez, who announced on Twitter he would be leaving the British team at the end of this season. Magnussen, the winner of this year's Formula Renault 3.5 feeder series, will be the first rookie taken on by McLaren since Lewis Hamilton in 2007. He said: "It's been my dream to drive for McLaren since I was a small kid." Magnussen is the son of former F1 driver Jan Magnussen, who also made his debut for McLaren, in the 1995 Pacific Grand Prix. He is one of two young drivers contracted to McLaren whom the team rate as potential future world champions. The other is Belgian Stoffel Vandoorne, who was second to Magnussen in Formula Renault 3.5 this year. McLaren's analysis of Magnussen's performance in their simulator suggests he is already faster than Perez, who has scored just 35 points to Button's 60 this year. The Dane has also been extremely impressive in his two F1 tests for McLaren, at Abu Dhabi in November 2012 and at Silverstone in July 2013. McLaren team principal Martin Whitmarsh said: "Next year, we'll witness the biggest raft of technical changes to Formula 1 many years. "Jenson's race-winning speed, intelligence and race-craft have long been a crucial advantage to McLaren. "But it's his skill as a development driver and peerless technical feedback that will be equally valuable as we make the transition into a new and complex technical formula during the winter and new year. "Kevin, too, is clearly very talented and very determined, and we therefore have high hopes for him. "Every time he's tested our Formula 1 car, he's been very quick and very methodical, and his feedback has been first-class." Magnussen added: "It's no exaggeration to say I've dedicated almost every day of my life to achieving the goal of becoming a McLaren Formula 1 driver. "I have an enormous amount of respect for everyone at McLaren and I want to say a massive 'thank you' to everyone for giving me this chance. I won't let you down, guys. "Equally, in Jenson, I have absolutely the ideal team-mate. He's extremely quick, obviously, but he's also very experienced and superbly capable from a technical perspective. "He's a Formula 1 world champion, which is what one day I also hope to become, and I'm determined to learn as much as I can from him." Mexican Perez, 23, was earmarked as a long-term replacement for Hamilton but leaves the team after just one season. The former Sauber driver has yet to announce his plans for next year.